My friend Susan and I maintain the Religious Resources directory. Users can submit sites for inclusion in our directory, but Susan and I personally review all submitted sites before they appear in the directory. Years ago, we started getting bots that would fill out and submit the site submission form, so I implemented a captcha system. A while back, the spammers figured out how to defeat the captcha, so the bogus submissions started flowing again. The other day, I changed the verification mechanism for the site submission form, so I’m one step ahead of the spam bots again. I’ve foiled the bots for the time being. After changing the verification, I saw a few bogus submissions still coming through. I noticed that the information was appropriate for the submissions: the ‘site name’ field contained a site name, the ‘URL’ field contained a URL, and, most tellingly, the submitter had selected an appropriate category for the site. The spam bots tend to enter data in fields pretty randomly, so this consistency struck me. I emailed Susan and told her that some of these bogus submissions must be hand-entered. However, I was doubtful about that, since this seems like such a time-consuming activity, but I really couldn’t think of any other plausible explanation. Theory confirmed. However, I don’t know how to defeat cheap labor. 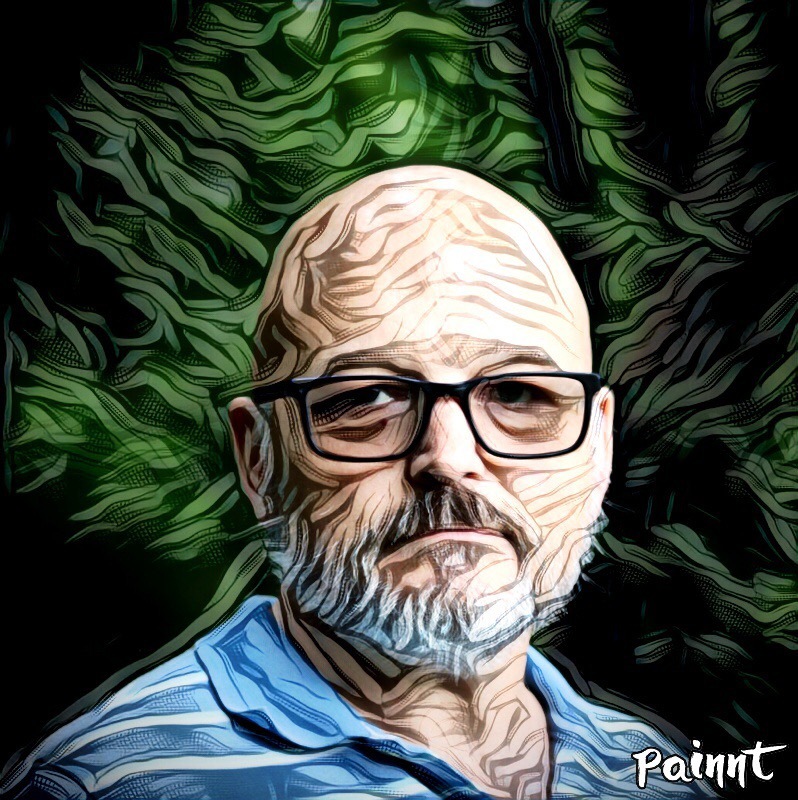 I’ve started following the feeds for several crags magazines and blogs. This showed up today: Cross stitch your favorite physicist. Cool. You could just as easily use the same pattern for needlepoint. According to this NYT article, the group Campaign for a Commercial-Free Childhood recently discovered what every parent of a public-school child has known for years: a lot of the stuff that Scholastic is selling in the flyers that they send home with kids is not books. Based on this shocking finding, CCFC has started a ‘Put the Book Back in Book Club‘ campaign. Susan Linn, director of the campaign, said she had received complaints from parents who were concerned that their children were being sold toys, games, makeup and other items under the guise of a literary book club that is promoted in classrooms. For parents like this, I have one piece of advice: if you don’t want your kids buying junk, don’t let them. Do you really need to complain to an anti-consumer watchdog group about it? Side note: I always just assumed that schools send these flyers home because the school benefits financially in some way from the sales it generates. If that’s true, it’s no obvious on the Scholastic web site (not surprising). Is my assumption correct? If so, can any teachers or school administrators explain the arrangement? One recent episode of the radio program Speaking of Faith is an interview with paleoanthropologist, fiction author and person of faith Mary Doria Russell. She is a fascinating person. During the interview, she described her Catholic upbringing, how she became a humanist for two decades and has most recently converted to Judaism. During the program, host Krista Tippett mentioned that Ms. Russell had described herself as an ‘agnostic Jew’ and asked her to elaborate on that. Ms. Russell answered, “The God that I almost believe in is the Jewish God” and went on to explain why she feels Judaism best reflects her own view of God. I love that quote! After listening to the podcast of this interview, I immediately went and bought two of Ms. Russell’s novels: The Sparrow and A Thread of Grace. I’m reading The Sparrow now and liking it so far. I’ve been a Flickr user for several years. Some time back, Flickr started offering detailed stats on your photo stream. 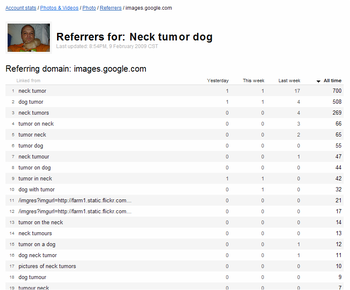 My most viewed photo–which has almost double the views as my second-most viewed photo–is Neck tumor dog. I thought that was curious, so I drilled down into the stats. 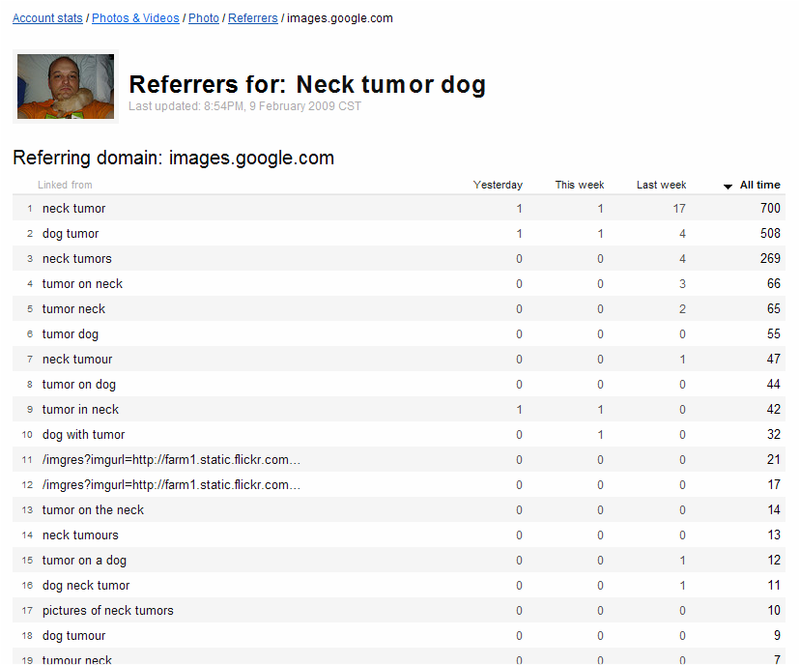 Images.google.com is, by far, the top referrer for this photo. No surprise there. What did surprise me is the search terms that led people to my photo. Below is a screen shot of the search terms. Click on the image for a larger version. I think it’s safe to conclude that not a single person who viewed my photo via Google image search found what he or she was looking for. Since my post about needlepoint a couple of days ago, I’ve been looking online for hip needlepoint work. The good news is that it exists. The Craftster forums are full of hip needlepoint designs (You apparently can’t link to a forum search. Go to http://www.craftster.org/forum/ and search for ‘needlepoint’). I mentioned in my previous post that I had been doing needlepoint since I was a teenager. I just ran across something that gave me a major flashback: back in the day, professional football player Rosey Grier was known for doing needlepoint. In 1973, he even published a book, Needlepoint for Men. Someone has graciously scanned pages from the book and put the images on flickr. Here’s a fact about me that you may not know: I do needlepoint. I’ve been doing it since high school. You can see some of my designs and projects on my needlework page. In the last few years, crafting has enjoyed a renaissance among younger people, fueled by the Internet. Etsy, for instance, has been both a cause and a result of this newfound interest in crafting. And for me, nothing epitomizes this renaissance better than Julie Jackson’s Subversive Cross Stitch. Last week, my friend and coworker Tracey Kirk invited me to do cross stitch with her at lunchtime while she knitted (my wife thinks this is a scream). While we did our respective crafts, we discussed this crafting renaissance. Tracey agreed with me that some crafts have enjoyed more new-found attention than others: knitting and cross stitch have certainly ridden the wave, but needlepoint has been left primarily in the hands of old ladies. I got to thinking about why needlepoint hasn’t ridden the wave of gen x or y (or whatever) crafters. Let’s think about why cross stitch, on the other hand, has made the generational leap. It’s easy to learn and do: there’s only one stitch. With Subversive Cross Stitch, Julie Jackson has capitalized on these features and added a big dose of irony. So, how does needlepoint compare to cross stitch? Complexity: There are many needlepoint stitches, though I only do one simple stitch (the equivalent of half a cross stitch stitch), so I think the general perception is that needlepoint is relatively hard to do. Speed: Unlike many cross stitch designs, with needlepoint the entire surface of the design is stitched. If you do the math, that makes it several times more time consuming than many cross stitch designs. Cost: Needlepoint canvas and thread tend to be pretty pricey. The materials for one of the pillow-sized projects that I do (though they are not by any means small beginner projects) probably costs me upwards of $75. Availability of supplies: In my experience, the big chain craft stores carry needlepoint kits, but not the materials for doing other designs (and the kits tend not to appeal to the hip young crowd, in my opinion). I get my supplies from an awesome local shop, The Needle Works, that sells only needlepoint supplies–but of course, I have to make a special trip halfway across town for supplies. Portability: As far as I know, all needlepoint uses a frame or hoop. Small projects might be easy to carry,but mine certainly aren’t: I staple my canvas to a 24-inch long wooden frame. It’s certainly not something I can just carry with me in case I have a few spare moments; and I certainly can’t just whip it out on a bus or airplane, for instance. If you compare needlepoint to cross stitch based on the criteria above, it’s clear why needlepoint hasn’t ridden the wave of twenty-first century crafting. Now, I’m trying to figure out ways to change the business of needlepoint to make it easier for poor young people to get started in it.